This is the third and final post on the remarkable story of the making of Lotus Blossom, the first theatrically-screened movie by Chinese Americans and which was filmed in Boyle Heights. Researched and written by Rudy Martinez, Boyle Heights Historical Society Advisory Board member, this post reveals a previously little-known aspect of the history of the Boyle Heights community. According to newspaper reports and advertisements and typical of the silent era, the film would be accompanied with live music, and there was the addition of two hostesses greeting patrons at the doors of the theater. Lotus Blossom finally premiered at the Alhambra Theater on Friday, November 25th and ran for one week. Despite its name, the Alhambra was actually located in downtown Los Angeles and not in the eastern San Gabriel Valley suburb of the same name. This ad appeared in the Los Angeles Herald 27 November 1921. The Alhambra was located on the west side of Hill Street, between 7th and 8th streets in downtown Los Angeles and was demolished in the 1930s, The site is now a parking lot. Courtesy California Digital Newspapers. Along with the image of Lady Tsen Mei, the Herald advertisement also featured two Japanese actors who appear in the film as Chinese characters. The young love interest for Lady Tsen Mei's character, Quong Sung, was played by Yutaka Abe, or “Jack Abbe.” Born in Japan, he arrived in the U.S. around 1914 and appeared in ten films. Shortly after completing Lotus Blossom, Abe returned to Japan and enjoyed a long career as one of Japan's most distinguished film directors, with such films as The Woman Who Touched the Legs (1926), and The Makioka Sisters (1950). The Emperor was played by another Japanese native, Goro Kino, one of the earliest Japanese actors in American cinema. He, however, died just a couple of months after the release of Lotus Blossom at age 44. As to the "hostess at the door" at the Alhambra, there were two young women fulfilling that role: Anna May Wong and Bessie Wong, who were not related. During this period, both were little-known, up-and-coming young actresses. Bessie only made about three films, but the year after Lotus Blossom was released, the Los Angeles-born Anna May Wong (actual name: Wong Liu Tsong) quickly rose to become one of the most popular Asian actresses in Hollywood and Europe during the 1920s and 30s, remaining a symbolic icon to this day. She was famously (or notoriously) turned down for the lead role as a young Chinese woman in The Good Earth (1937), which went to German actress Luise Rainer, earning Rainer an Academy Award, but denying Anna May Wong a once-in-a-lifetime breakthrough opportunity. 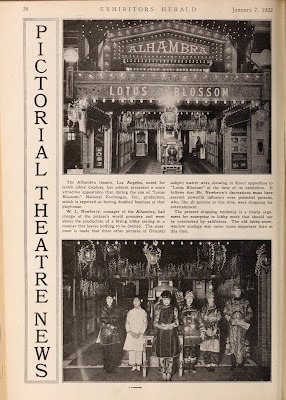 Shortly after the Los Angeles premiere for Lotus Blossom, The Exhibitors Herald published two photos featuring the lavish display for the lobby of the Alhambra Theater during the film's run. The photo includes two young and little-known actresses at the time, Anna May Wong in the center and Bessie Wong to the left as greeters. 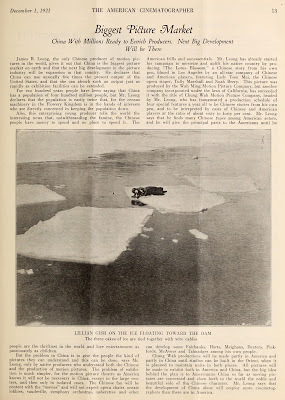 From the Exhibitors Herald January 7, 1922. Courtesy of The Media History Digital Library. 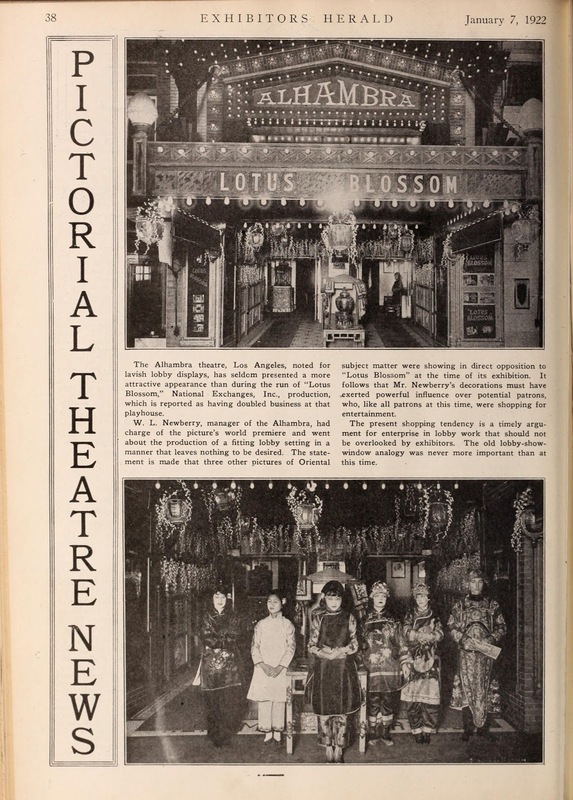 In 1922, following its Los Angeles premier, Lotus Blossom appeared in several states, including Pennsylvania, New Hampshire, and Kansas, and even was shown in a theater in Mexicali, Mexico. The film was also screened in a Washington D.C. ballroom for a visiting Chinese delegation. One of its last showings was at the New Virginia Theater in Bakersfield, California on October 20th, 1922. It was generally assumed by film historians that Lotus Blossom was probably never shown again after that year. However, a very recent look through databases of U.S. newspaper archives revealed that the film was indeed briefly shown again nine years after it premiered, but under a totally different name! On May 2, 1930 the Los Angeles Times published an ad for the screening of Daughter of Heaven, starring Lady Tsen Mei, at the Filmarte Theater in Hollywood,. 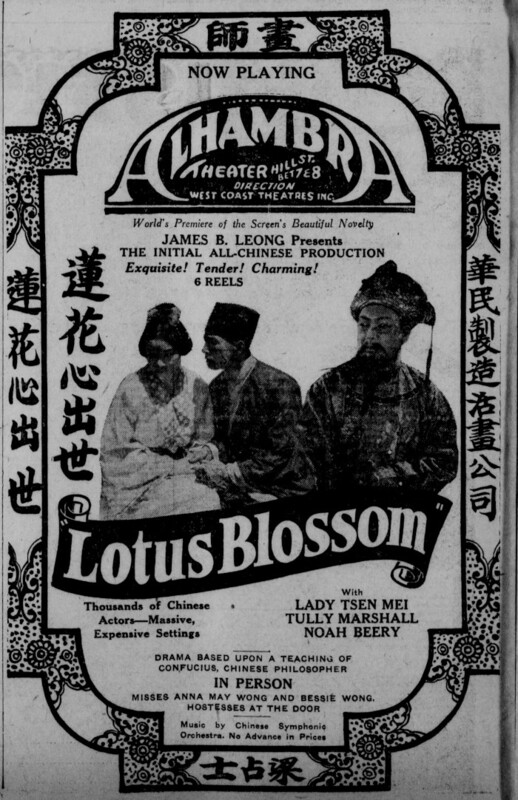 In 1930, Lotus Blossom, was briefly released under the title, Daughter of Heaven, and advertised as “actually filmed in China.” Los Angeles Times, May 2, 1930. Courtesy Los Angeles Public Library. Reviews for the film appeared in the May 5th edition of the Times, as well as in the Hollywood Filmograph. The name of the cast and synopsis of the plot in the reviews are identical to Lotus Blossom, except Daughter of Heaven was being advertised as “actually filmed in China with [a] native cast.” Today, only one 12-minute reel of this six-reel feature exists. Although no one knows exactly when most of the reels for Lotus Blossom went missing, it's tantalizing to consider that perhaps Lotus Blossom might still exist intact, somewhere, as a “foreign film” under the title of Daughter of Heaven or maybe even some other name. In the Los Angeles Times May 4, 1930, under the headline “Films Showing”, a small list of films premiering locally was published. One of the movies listed was Daughter of Heaven, formerly Lotus Blossom. Los Angeles Times, courtesy of the Los Angeles Public Library. After completing Lotus Blossom, Leong “suspended production” under the moniker of the Wah Ming company and it was soon renamed, according to the Times, "the Chung Wah Motion Picture Company, with a wealthy Los Angeles area Chinese by the name of Quan Foo as president, which will be headed by Mr. Leong,” as reported by the Times on November 27, 1921. But the company was never heard of again, and Lotus Blossom would remain the only film it ever produced. The celluloid image for Asians overall did not improve. In fact, some film historians assert that the stereotyping only intensified as film characters such as Charlie Chan and Fu Manchu were enthusiastically received by mainstream American audiences in the Twenties and Thirties. By 1928, Hollywood's rising Chinese-American star, Anna May Wong, relocated to Europe to make films. Another roadblock for creating and distributing more Asian feature films during the silent era, according to film historian Arthur Dong, was that the Chinese market in the United States was not large enough to support an alternative distribution system as was the case for so-called race films for African Americans audiences, or Yiddish film for Jews. James B. Leong continued to work in Hollywood for several decades, primarily as a minor character actor. In 1952, he authored an alarmist anti-drug book titled, Narcotics...The Menace to Children. In 1956, he wrote and directed an anti-drug play, The Devils' Paradise, staged in a tiny theater in Hollywood. To play the lead, Leong hired an actor who was a recovering drug addict and was experiencing much difficulty finding work – none other then screen horror legend, Bela Lugosi, known for his iconic starring role in Universal Studio's Dracula (1933). The play ran only one weekend, and, shortly afterward, Lugosi filmed scenes that would later appear in Ed Wood's Plan 9 From Outer Space. With little notice or mention, Leong died quietly in Los Angeles on December 16, 1967, at the age 78. As mentioned in a previous post on this blog (click here to see the post) focusing on the history of the Perry-Davis/Ganahl mansion and the Bernstein studio, it's unknown exactly when the mansion was razed. Today, several apartments now cover the eastern end of the property along Boyle Avenue that once was the site for the former Bernstein Studios and the Wah Ming Motion Picture Company, while Interstate 5 cuts through the west side. To the south was Stephenson Avenue, now Whittier Boulevard. The existing 12-minute segment of Lotus Blossom can be found online, as it's in the public domain. For some insightful commentary about the film, the clip can be seen in disc 2 of More Treasures from American Film Archives from the National Film Preservation Foundation, with audio commentary provided by documentary filmmaker and film historian, Arthur Dong, and notes by Scott Simon. While James Leong's pioneering efforts in Chinese-American film-making may not have been successful, it is notable that he was featured in at least two magazine articles found by Rudy, in which Leong promoted the potential and possibilities for a huge market in China for American films. 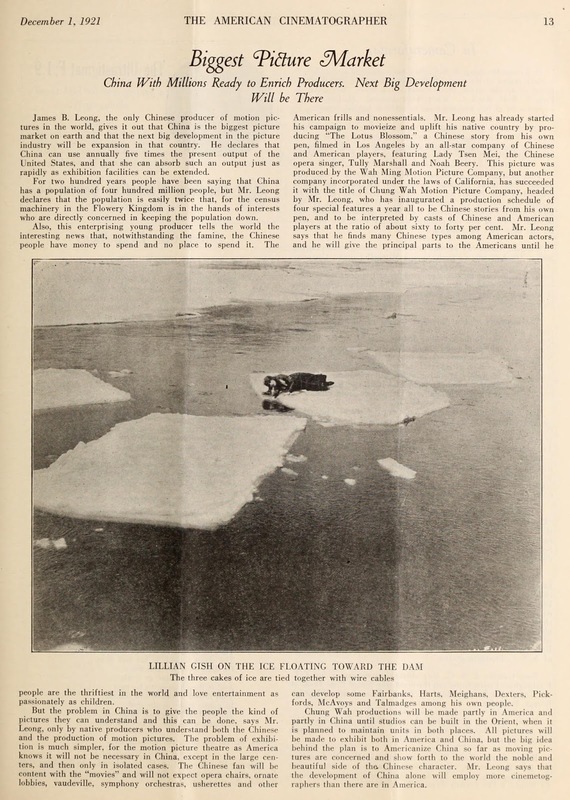 The 1 December 1921 issue of The American Cinematographer features an article, "Biggest Picture Market" which dealt with James B. Leong's assertions that China would be the world's largest market for films. In the 1 December 1921 issue of The American Cinematographer, Leong was summarized as saying that the Chinese "are the thriftiest in the world and love entertainment as passionately as children." Claiming that the official estimates of 400 million people in China were only half correct, he stated that his goal was to bring American film-making to his native country "and show forth to the world the noble and beautiful side of the Chinese character." It was added that China's future development in film would lead to more cinematographers there than in the U.S. 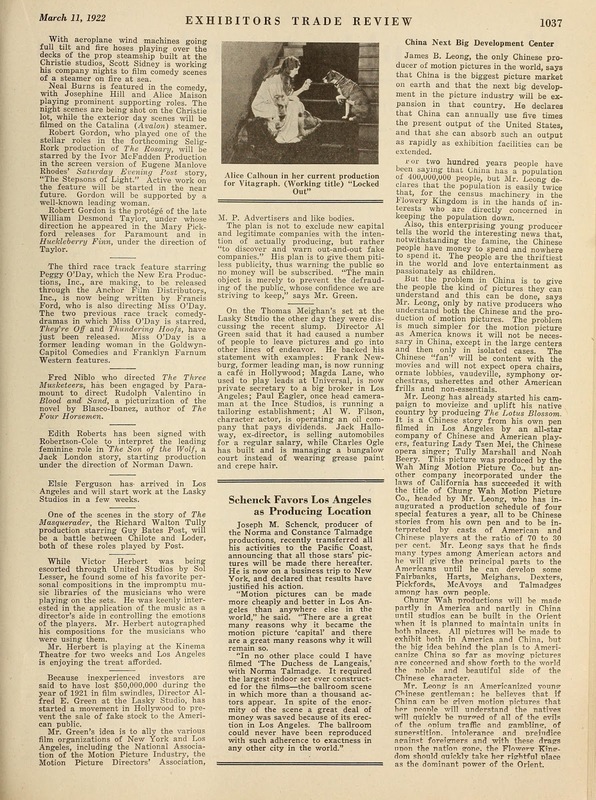 While much of this 11 March 1922 article from Exhibitors Trade Review copied the text word-for-word from the above-mentioned The American Cinematographer piece, it featured an extraordinary quote from Leong about the potential of "quality films" having a moral effect on Chinese moviegoers. will quickly be purged of all the evils of the opium traffic and gambling, of superstition, intolerance and prejudice against foreigners and with these drags upon the nation gone, the Flowery Kingdom should quickly take her rightful place as the dominant power of the Orient. Given the tremendous transformation of China in recent decades, its surging film industry and the growing presence of Chinese investors in Hollywood and in the movie theater world, Leong's views are very interesting and timely. Many thanks to Rudy Martinez for his detailed research and writing on this post. Editing and postscript (images found by Rudy) by Paul R. Spitzzeri, Assistant Director, Workman and Temple Family Homestead Museum, City of Industry.